This was Liz Steel's week, and I've sketched with Liz in New York City during each of her visits, so it was a real treat to be in her class. I don't have any tea cups in my apartment, so I chose the only decorated cup we have - an Antoni Gaudi espresso cup. 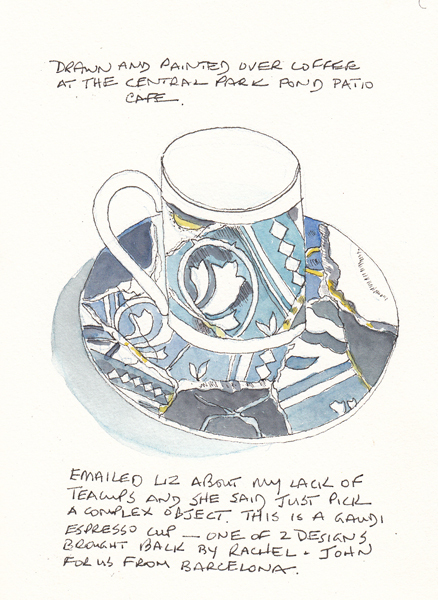 Here are my preliminary exploratory drawings, followed by my cup/saucer painting. 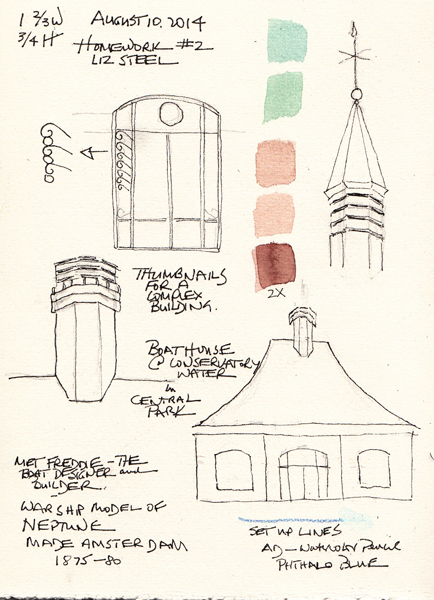 I was at the Conservatory Water - Toy Boat Pond when I began Homework Assignment 2 - draw a building. 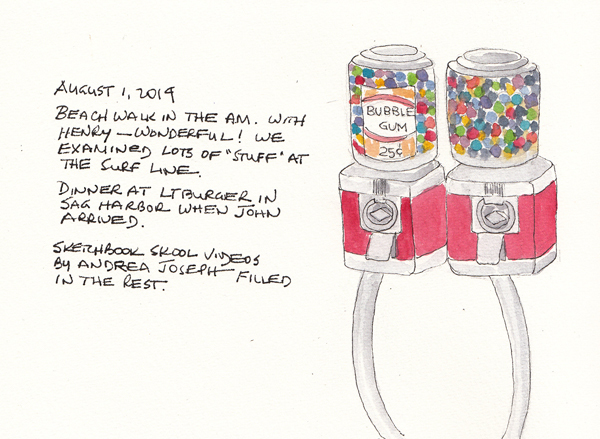 Here are my preliminary thumbnail sketches of the Boat House, where they store remote-control boats for the weekly races and the rental remote-controlled boats. And this is the Kerb Boathouse, which is adjacent to the Patio Café. 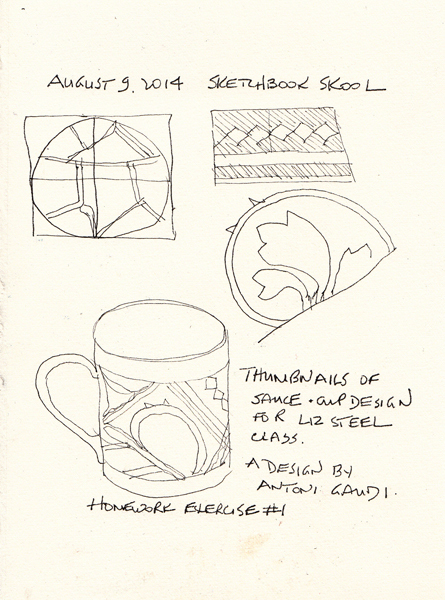 I really enjoyed Semester 2 of Sketchbook Skool - and will go back and use many of the techniques used in homework assignments in the future. It was possible to watch each teacher during their week, and to do homework assignments, but there is so much more to get from the videos/demonstrations. I took notes and saved transcripts - and look forward to more sketchbook play using these exercises. Semester 3 is being filmed - and I look forward to learning who the teachers will be! 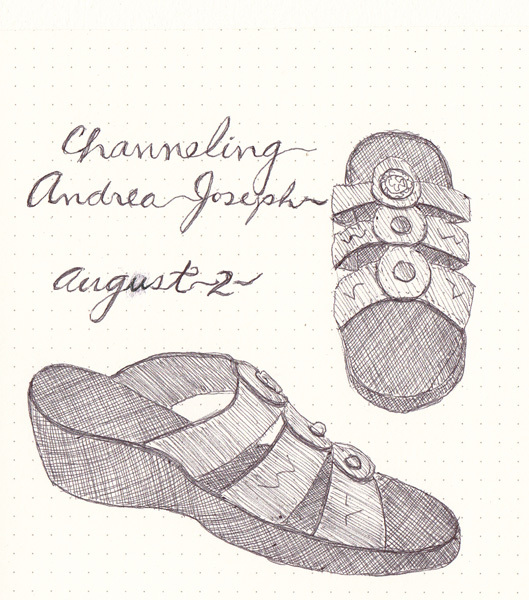 Andrea Joseph, whose blog I followed for years, was our week 5 teacher in Sketchbook Skool - Semester 2. I have always been amazed at her ballpoint drawings and that was our first demo and homework assignment. I used a Staples black ball point pen and my sandals for the exercise. Equally mysterious, mainly because it was impossible to imagine someone taking the time to draw these, were her collections of buttons, keys, matches etc. Over the years I tried to picture Andrea, this incredibly patient artist, and I was finally thrilled to meet her on multiple videos. Drawing a collection was our second demo and homework assignment. 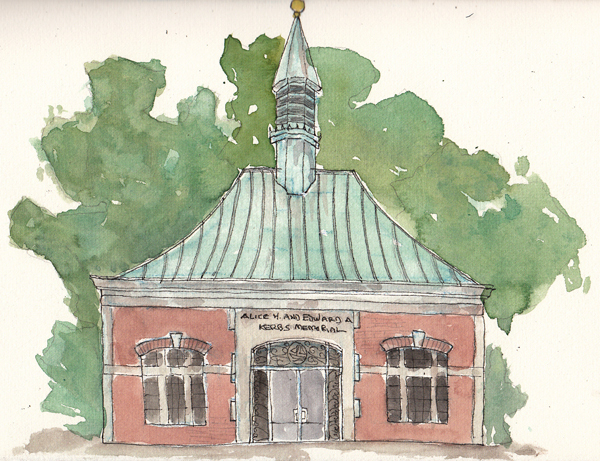 She doesn't use watercolor for hers, but I seem unable to leave out color. So here is my mug collection done in my own way. It is a work in progress - one mug per day. 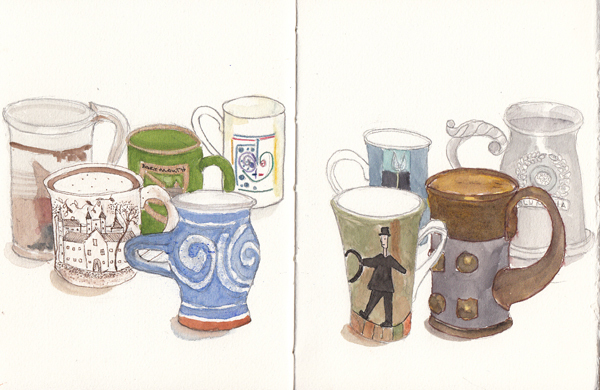 The pencil outlines for my next two mugs can be seen on the 2 page spread. 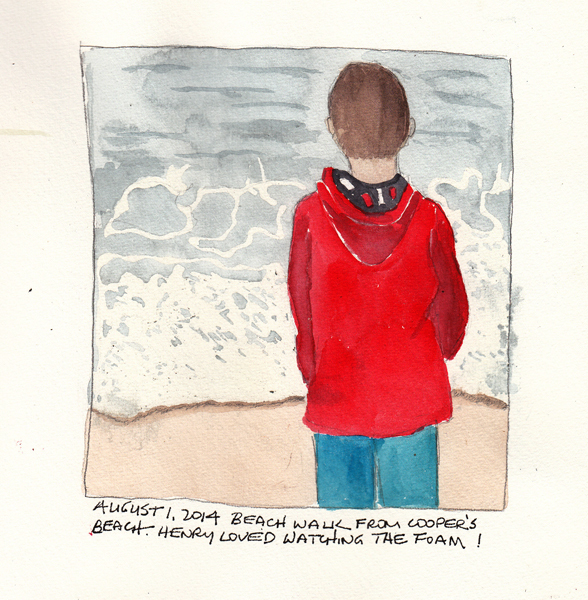 We were back at the beach for the last time this summer. Three of our grandchildren just returned from sleep-away camp and we gathered to celebrate their return. 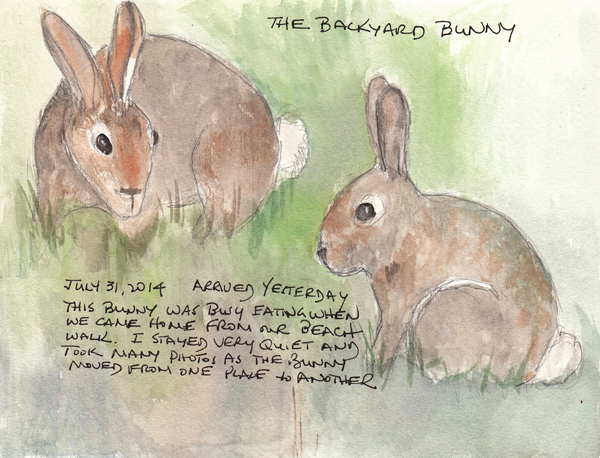 This bunny was sitting in the yard, eating in the grass, and I only had my camera in hand. I took several photos without breathing or moving and did this sketchbook page. Dinner with our daughter, her husband, and their 3 children at LT Burger in Sag Harbor. These gumball machines were hard to resist. 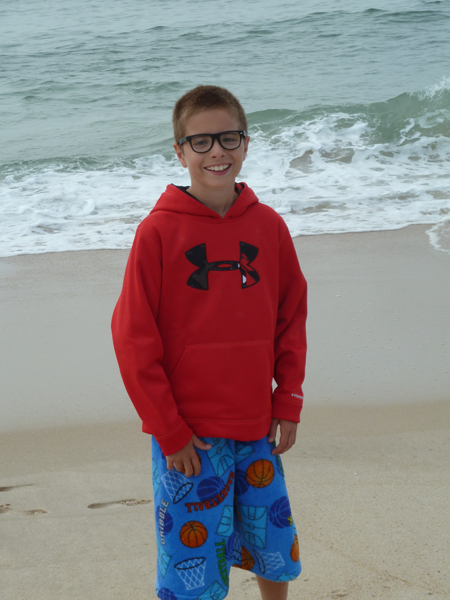 Our oldest grandchild, 11 year old Henry, went on our 2 mile early morning beach walk again this year. He is delightful because he has a natural curiosity about everything we see. He loved watching the waves roll in and generate foam. And spent time with me examining and photographing a dead spider crab. 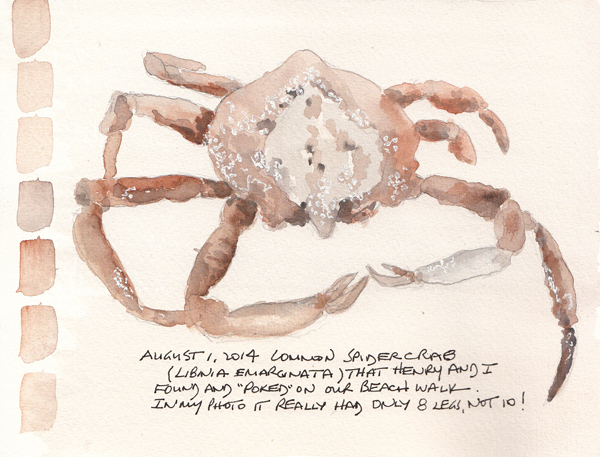 We saw the poor crab again today and it really did have 8 legs and two claws at one time. 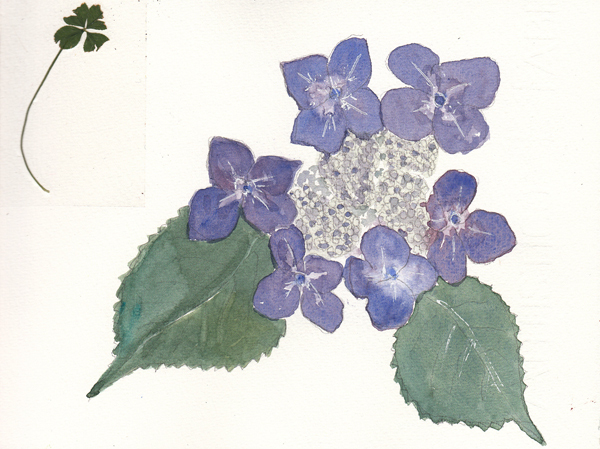 A battered 4 leaf clover and one of the variant hydrangeas at our daughter's house. Cathy (Kate) Johnson was the Skool teacher this week and our first homework assignment was to draw birds - or other shapes - from nature. We see many birds in the Café in Central Park, but they move very rapidly, too rapidly to see their coloration. The lady at the next table was feeding them breadcrumbs last weekend and I was able to take several photos and use them to both identify the birds and paint them. 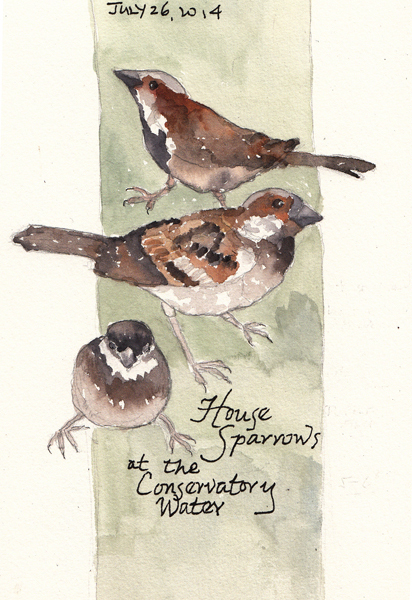 Now I see and recognize house sparrows everywhere in the City. Our second homework assignment was to draw trees, creating depth in the field and varying our greens. She has a wonderful YouTube video showing how she mixes greens. I haven't ever had green on my palette and always mix them. But I still learned lots. Landscapes are my least favorite subject to paint and I was glad that I had to do this one if I wanted to follow our Semester 2 class lessons! Last Friday I met my friends at Penn Station and took the train to Morristown where 4 of them had a major Art Quilt exhibit named Semper Tedium. Mark Lipinski reviewed the exhibit and posted many photos on his blog - see this link https://theslowstitchingmovement.wordpress.com/. 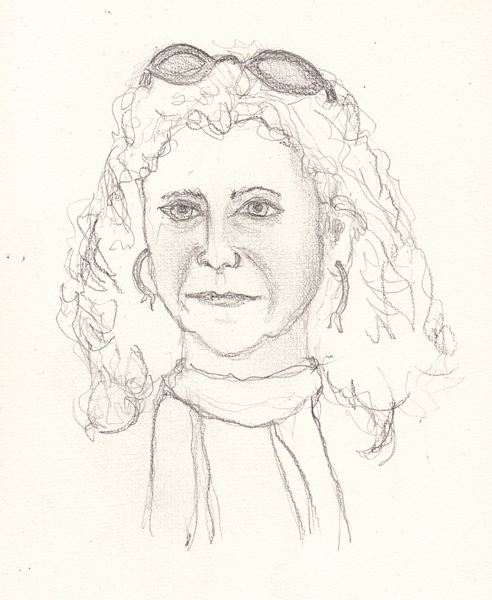 On the way home on the train I sketched Benedicte. 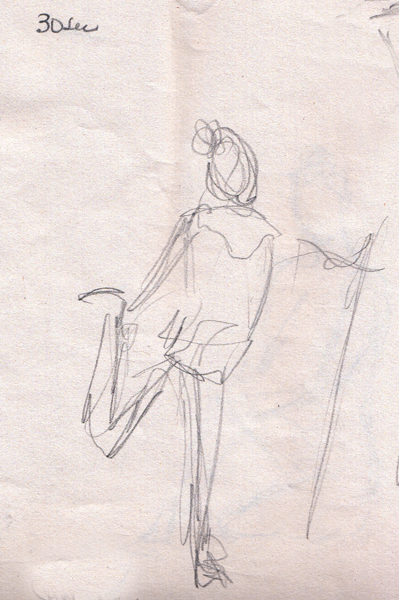 New York's Battery Park Conservancy offers free figure drawing (clothed models) every Wednesday afternoon from May through October. They supply the art supplies, so visitors walking through Battery Park are even invited to join in. 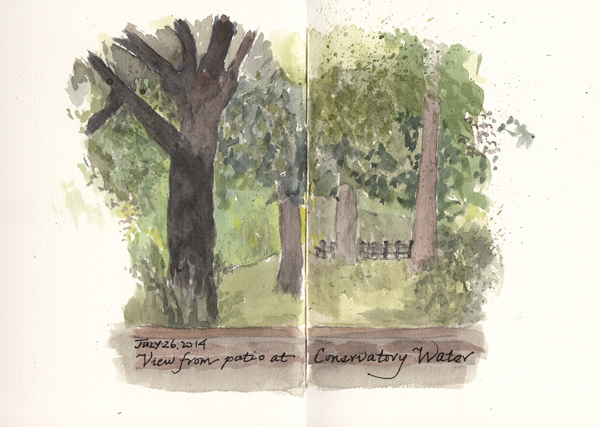 This was my first visit this year, and I was surprised by multiple 30 second sketches to warm up - a first for me. 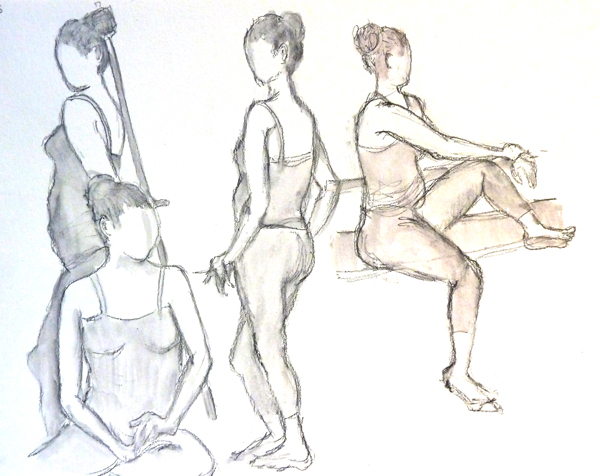 This is one of mine, just to show my basic approach - a gesture drawing, of the model, who held a big stick and had her hair in a top-bun to combat the heat. 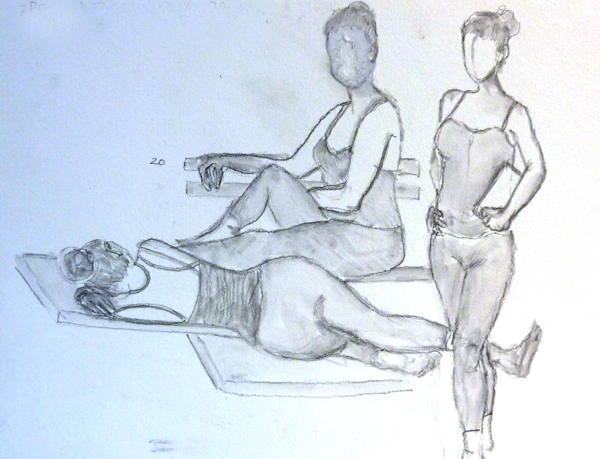 I sketched four 5 minute poses on an 11 X 15" piece of paper, using a General Sketch and Wash pencil (soluble graphite). These big sheets were photographed, not scanned. These are two 10 minute poses and one 20 minute pose. Because I had lots of time I tried to add a few facial features - MISTAKE- and then rubbed them out!